The Morawski family truly embodies what it means to live, work, and play on the riverfront. They have been residents of the Capitol Quarter townhomes since 2012, and Mike is a Harbor Patrol Officer with the Metropolitan Police Department. 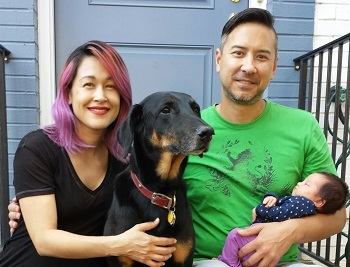 Mike, Sabrina, their daughter Mikaela, and pup Mina love taking advantage of all that the Capitol Riverfront has to offer for all members of the family. Sabrina and I moved to the Capitol Quarter townhouse development in early 2012 from the Virginia suburbs. When we first toured the model homes in 2011, we were not even house hunting. We bought our house pre-construction when the vast majority of businesses and restaurants were just proposed. The townhouse itself, Yards Park, and promise of shops and restaurants is what made us decide to move here. With Capitol Riverfront now well developed, it has become family friendly. Our daughter Mikaela is only three weeks old, but we have already been walking her around and can’t wait until next spring (and years to come) for her to fully enjoy everything. We are extremely glad that we moved. The Capitol Riverfront neighborhood is great and we are fortunate to have great neighbors who enjoy it as well. Capitol Riverfront has a little bit of everything for everyone. It’s lively without being too busy. On top of that it’s very convenient. What is your favorite place to dine in the neighborhood and why? Osteria Morini. We love Italian food, and not only does Morini have the best Italian food in the neighborhood, but some of the best in the city. What is your favorite event in the Capitol Riverfront? What has been the most significant change you’ve seen in the neighborhood since you’ve moved here? The number of apartment and office buildings that have gone up. Be a part of the community, and enjoy all that the neighborhood has to offer. What is your ideal lazy weekend morning in the neighborhood? If we’re supper lazy we won’t even leave the house. Otherwise, we’ll grab a late breakfast and coffee at Lot 38, or Philz, and enjoy it by the river.